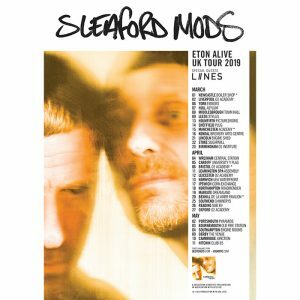 Sleaford Mods – one of the most vital and relevant bands around – announced their Eton Alive tour today and we’re happy to say LIINES will be joining them across all 32 dates. The Paul Tipler-produced album gathered acclaim from the likes of John Kennedy, Steve Lamacq and Amazing Radio’s Shell Zenner as well as a 4 star review in Q and praise from other publications. 2018 has also seen the band play Dot to Dot Festival (Manchester and Nottingham), Ramsbottom Festival, and a headline set at Words And Music (Manchester). Tickets go on pre-sale at 10am 3 December (sign up through the Sleaford Mods mailing list) and general sale on 7 December. 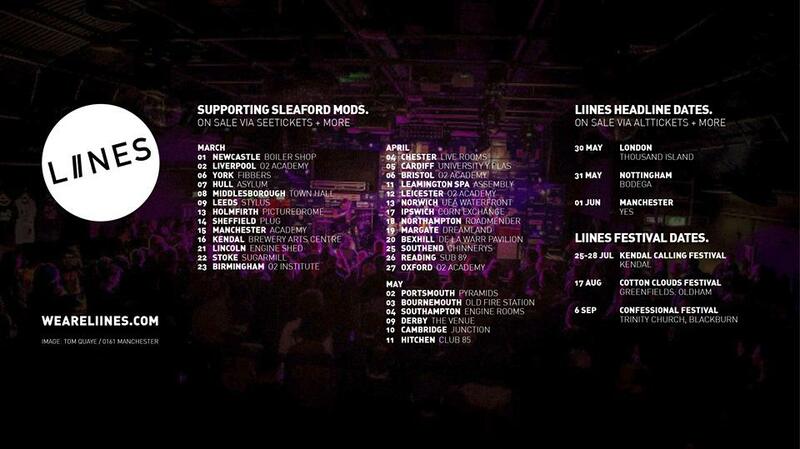 11 May: Club 85, Hitchin.